“Absolutely,” White House Press Secretary Sarah Sanders replied. Manigault Newman, who appeared on ABC's "The View", claimed Trump and the administration lied to the American people about the nature of the Robert Mueller investigation into alleged collusion between the Trump campaign and Russia. She also claimed she and other White House staffers would back everything the president said. “We’d have to repeat those lies,” Manigault Newman told ABC’s “The View” panel. Manigault Newman claimed the communications meeting Trump “crashed” was about tax reform and a trip to North Korea, but the president veered off topic and took the lead. During the meeting, Trump criticized the Hillary Clinton campaign for allegedly spending $9 million on an anti-Trump dossier released last year that alleged ties between Trump and Russia during the presidential election. Nick Merrill, a spokesman for Clinton, hit back at that claim. "Trump is as delusional behind closed doors as he is in public," Merrill told ABC News. Manigault Newman, a former die-hard Trump supporter turned Trump strident critic, claims Clinton was "robbed" of presidential victory. “Hillary Clinton was robbed and I was a part of co-conspirator in that robbery,” Manigault Newman said. Manigault Newman said she blamed herself for staying with the Trump administration for as long as she did - admitting she “regrets" she was "so complicit” with their relationship. 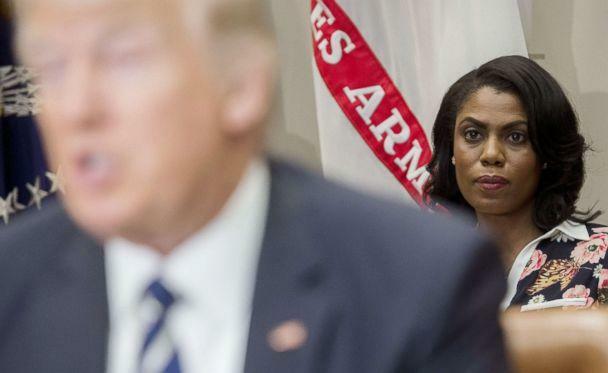 Manigault Newman said she was nervous about releasing the tape because Trump has tried to "silence" her since the last release of a disclosed audio tape and she is currently going through arbitration with the president. "He has sicked his entire legal team on me to stop any further release of tapes," she said. "He wants to make sure that I'm silenced so I don't talk about the bribe that Laura trump tried to offer me for $15,000 per month. They want to shut me down, and so every time like the announcement that I was coming on, my attorney who is backstage got a phone call from his legal team." Manigault Newman, who was terminated as the director of communications for the Office of Public Liaison, released a secretly recorded tape last month with President Trump that revealed the conversation between the two after Chief of Staff John Kelly fired her. The White House has not commented on the newly released audio tape.